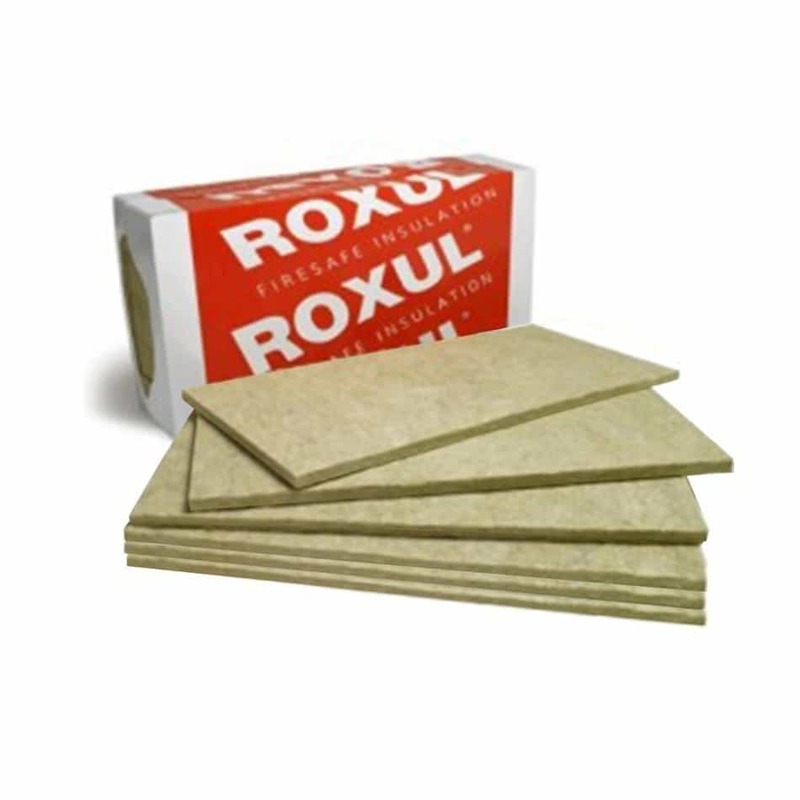 ROXUL Safe n Silent Pro is a stone wool insulation product for use in interior wall partitions of residential wood and steel stud construction where superior fire resistance and acoustical performance are required. 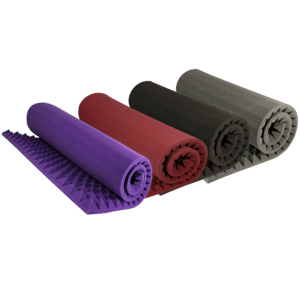 This non-combustible, lightweight product has excellent acoustical dampening properties and is dimensionally stable which makes it ideal for friction fit into walls, ceiling and floor applications. The product is chemically inert; therefore it will not promote corrosion. 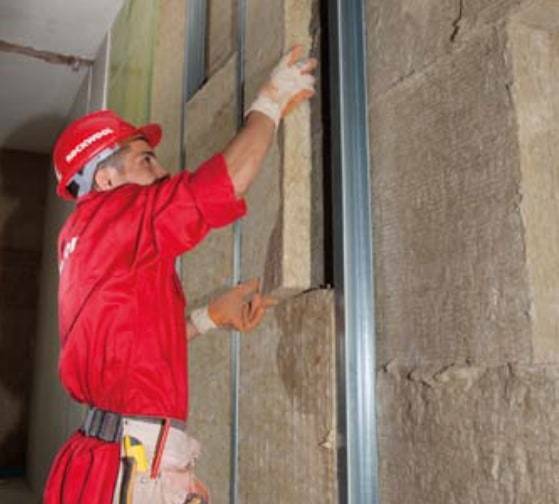 Rockwool™ is a nature-based insulation made of volcanic stone, a safe and sustainable material that continues to perform and lasts throughout the lifetime of the building. It is designed and manufactured to achieve excellent acoustic insulation performance in all types of drywall partition configurations. 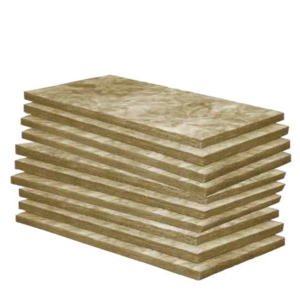 This product is designed for interior wall, ceiling and floor applications. 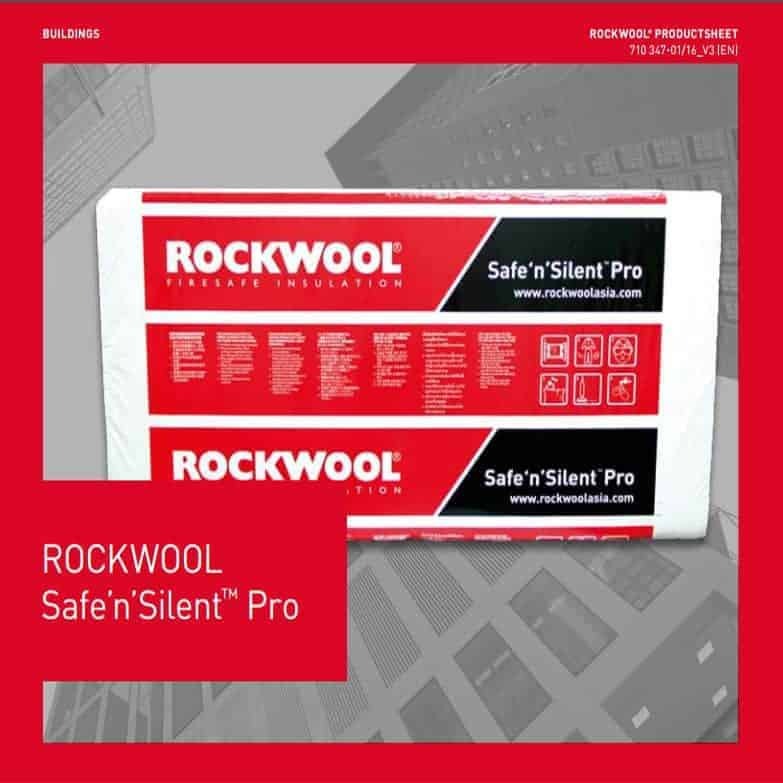 ROCKWOOL™ Safe‘n’Silent Pro is recommended to be used for drywall partition applications in recording studios, home theaters, auditoriums, hospitals, cinemas, schools, offices, residential and industrial buildings. It may be used for metal stud partitions for easy installation, keeps its shape over time without sagging or slumping in the wall cavity. Safe’n’Silent Pro is both water repellent and moisture resistant (tested under EN1609). The product repels water even when exposed to temporary splashing of rain water at construction site and still able to maintain its shape over time; thereby delivering maximum noise and fire protection. Moisture and nutrients are necessary conditions for fungal growth. Since more than 95% of this product is made up of inorganic fibres, there is little nutrient source to allow fungal growth. Hence, it does not cause corrosion of the metal studs nor promote fungi growth within the wall cavity. Few insulation can take the heat like we do – with the ability to withstand temperatures of over 1000°C without melting according to DIN 4102-17. 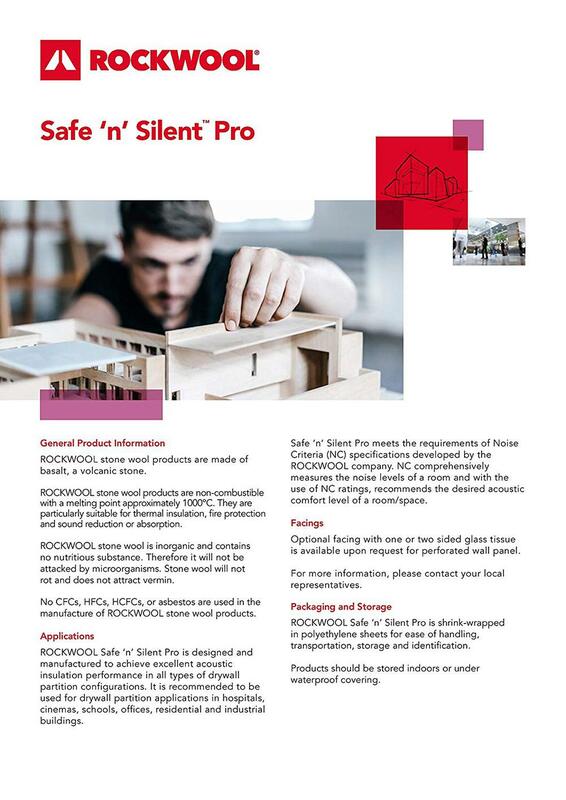 Safe’n’Silent Pro is non-combustible and achieves the highest European fire classification, A1, according to EN13501-1. 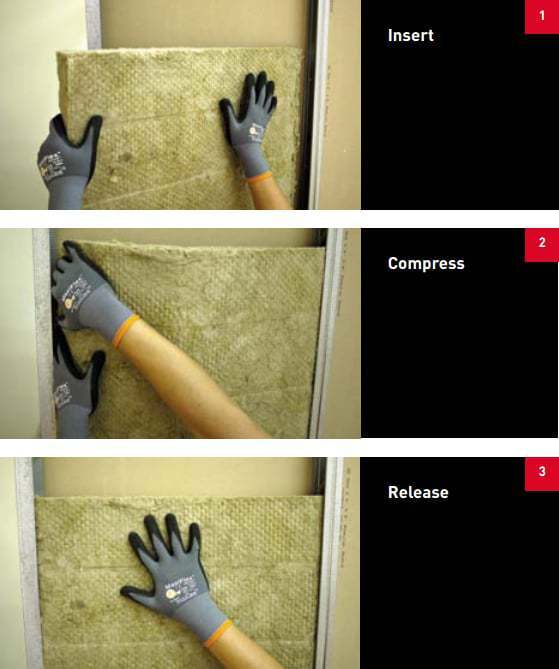 This means that it can effectively impede the spread of fire and provides the critical extra minutes for occupants to escape from a room or building. 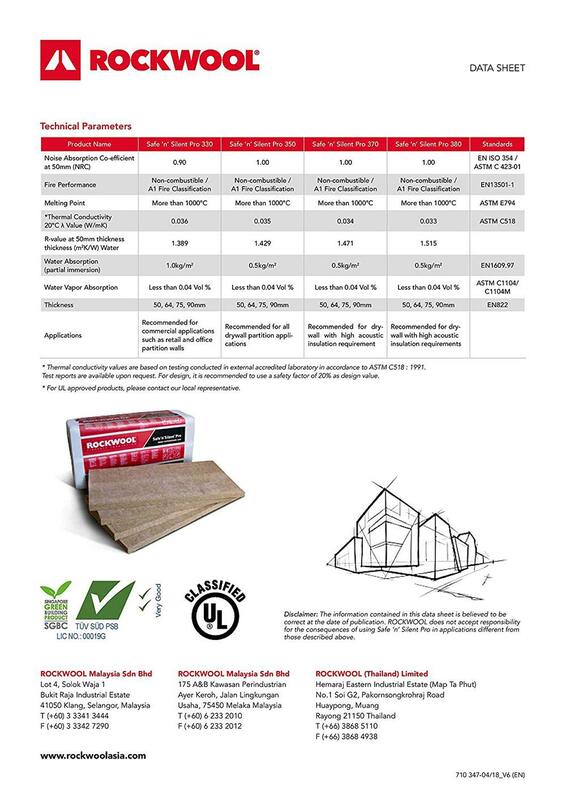 With its fire retardant properties, Safe’n’Silent Pro also does not contribute to fire load within the building and complies with ASTM E84-10 to achieve Flame Spread ‘0’ and Smoke Development ‘5’ that surpass NFPA Class A requirement. It is also simple to cut Safe’n’Silent Pro to size with a serrated knife, for a fast and easy installation between studs, around electrical boxes, pipes, wiring, ductwork and even between studs and joists of non-standard widths. The very nature of stone wool makes Safe’n’Silent Pro a wise long term investment that works continuously without requiring any maintenance. 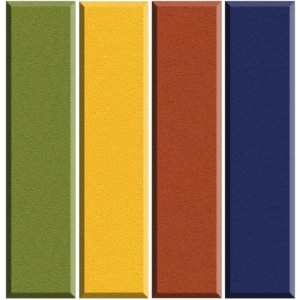 The higher density material provides superior sag resistance and fit when mounted within a frame or wall cavity. It can be easily cut and trimmed for the best possible fit into the partition wall cavity, assuring there will be no gaps that may compromise the performance of the system. Safe’n’Silent Pro keeps its shape over time without sagging or slumping in the wall cavity. All these ensure a partition wall system that protects its occupants against noise and fire for the lifetime of the building. Very Professional. Product got delivered in 3 days. 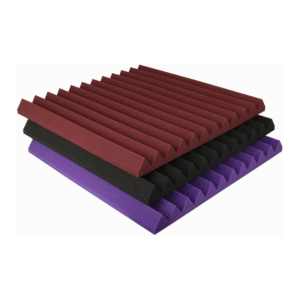 The best sound proofing material I have purchased. Best people to deal with . There’s really not much to say here. These guys are professionals and the best I’ve encountered so far. Very professional responses, quick shipping by Fedex as promised. 35 boxes delivered safe and sound in Chennai in 4 days. The thickness of these panels is 50mm and the density varies from 40 kg/m3 to 100 kg/m3. Received safely in 24 hours and sound and cannot wait to install it. Thanks for the urgent delivery. Received 15 boxes in Chennai in only 3 days and material was well packed. I build studios and home theaters. 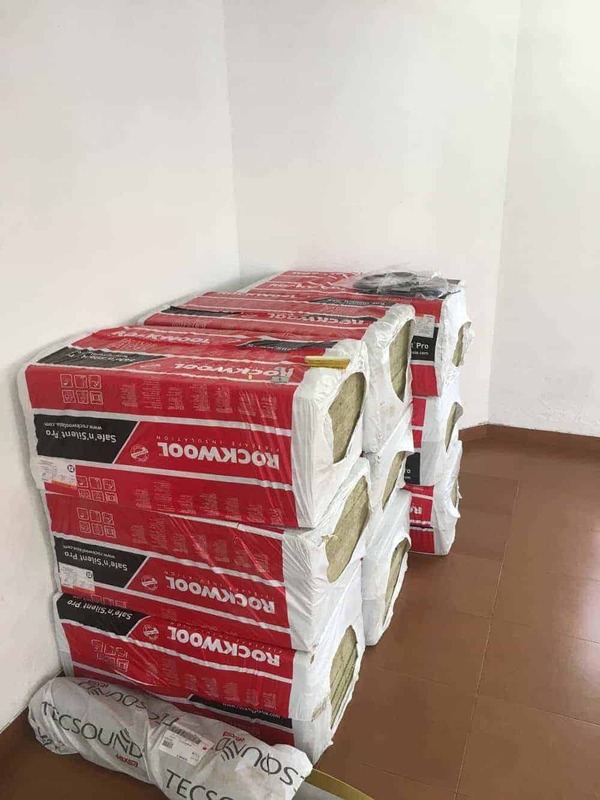 This product has good performance I have bought many local rockwool brands in the past but this is more rigid and stays within frame without sagging. Very good absorption performance and excellent thermal insulation also. Also easy to cut. Got my order in four days, two days ahead of promised date. Recieved safely and product is original. Ordered 4’x2′ panels 6 nos but received 3′ x 2′ panels 9 nos. Now I see description has been updated on website to match actual product. Other than size problem its original and very high quality product. Will buy more. Exactly what I needed for my studio. Good price and original Roxul Canada product. This is not comparable to regular rockwool available in local Delhi market. Rigid boards and very high density. Login and get an instant 5% off on your shopping cart!